Parenting time provisions no longer apply because our children are no longer in daycare. The right of first refusal has become a source of conflict between parents. One parent is not exercising his or her parenting time. 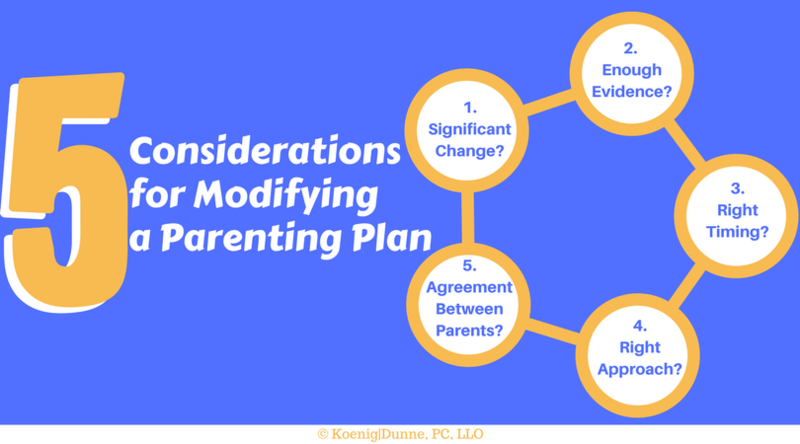 To modify a parenting plan, Nebraska law requires that a “material change in circumstances” have occurred—one that was not anticipated at the time the original parenting plan was entered by the court. In other words, something unexpected and significant must have happened since the entry of the original parenting plan to warrant changing the plan. Common examples of such events include: new work schedules, new living arrangements, new preferences of the child, and new criminal charges filed against a parent. The more specifically that you can describe and evidence the issue you are seeking to modify, the more likely you will be able to convince the court that a modification is necessary. For example, if a parent is consistently forfeiting parenting time, thus prompting a possible modification of that time, document all such forfeitures, including the date, amount of notice given, and magnitude of disruption. The timing of a modification action can often seem like a catch-22. Bringing the action too soon could result in the court deferring to the original parenting plan. But waiting too long could be viewed by the court as your agreement on the issue that you would like addressed. Therefore, it is important that you meet with your attorney as soon as possible to determine whether the timing is right to seek a modification. Nebraska law requires that parents attempt to mediate parenting-plan modification issues before seeking court intervention, and the mediation process can often be invaluable in helping parents to reestablish communication on the issues prompting a modification request. Most parenting plans contain language that allows parents to deviate from the terms of their parenting plan by mutual consent. For example, if 8:00 p.m. drop-off times are not working, both parents may agree to 7:00 p.m. drop-offs without having to return to court. This is in contrast to child support, which is not modifiable by agreement. Contact your attorney to determine whether you may consensually deviate from your parenting plan. Your legal team at Koenig|Dunne understands the nuances and complexities of modifying a parenting plan, and we are here to help guide you through the modification process.